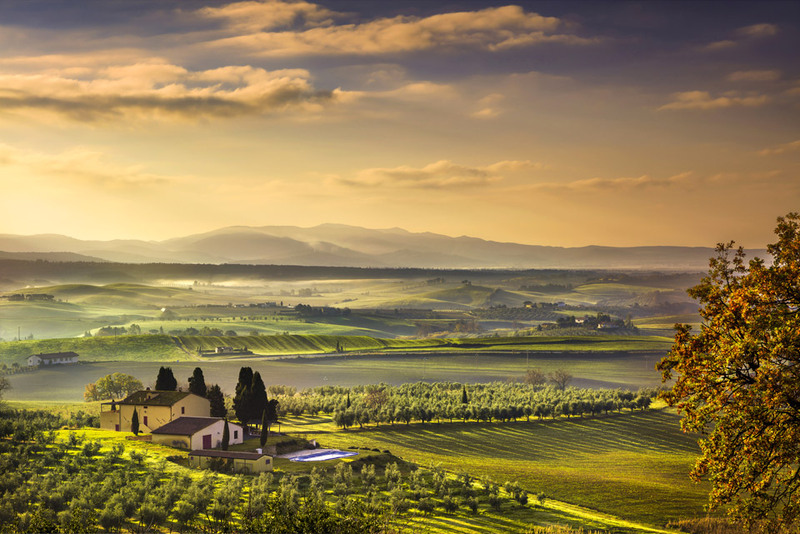 When you hear the name Tuscany, what is the first thing that comes to your mind? 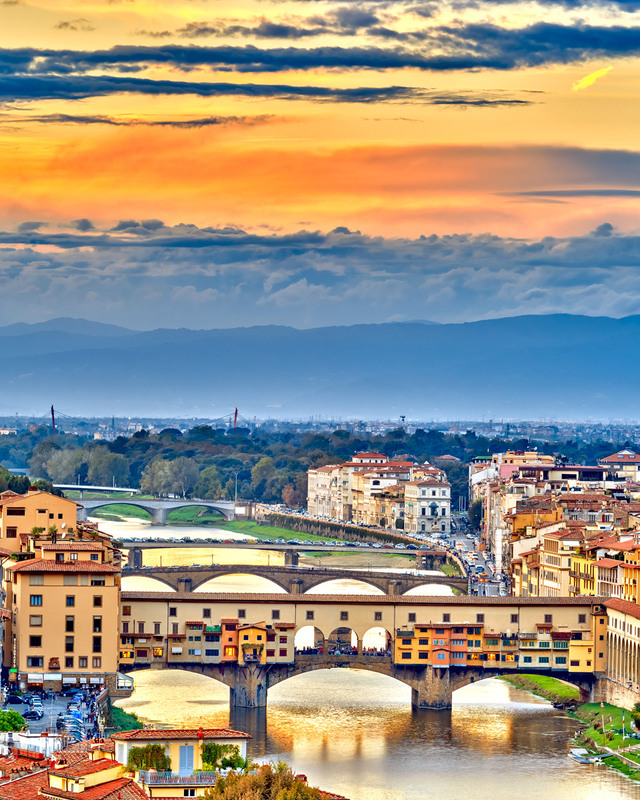 Is it the Renaissance art and architecture of its capital Florence, is it the wine and food from the surrounding villages, towns and regions or is it the beaches and the islands? For me it is all of those mentioned, but more importantly it is the breathtaking landscape of the region. If you don't believe me then have a look at ten of the most amazing places in Tuscany and then let me know what you think in the comment section at the end. You may be familiar with the name because of the regions acclaimed wines. Set in a sprawling landscape that is divided into seven sub-zones Chianti is another of Italy's picturesque regions. The area falls under the provinces of Florence and Siena. The chestnut, pine and oak forests form a panorama that is best enjoyed from Radda, an area filled with castles that overlook the landscape. Palazzo del Podesta is one of the most famous places with holiday makers, thanks to plenty of accommodation in the farmhouses and hotels that dot the area. In Castellina look out for the Etruscan tomb remains together with the renaissance architecture of the two palazzi and the fortress of Rocca. 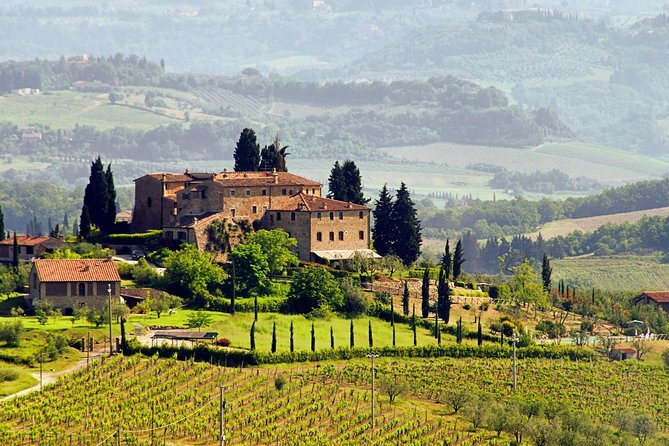 During a visit to Chianti no holiday maker should pass the opportunity to sample the world famous Chianti wines. Chianti Classico, Chianti Colli Fiorentini and Chianti Rufina are a few among the many selections that are available for sampling. From grilled Panzanese steak, stuffed rabbit to beef tartar there is a carnivorous feast to enjoy in Chianti when night falls. You should also have a taste of the crunchy cantuccini accompanied with sweet vin santo, it's a classic that you would probably enjoy. Using public transportation to move around Chianti can be problematic, however, renting a car or using a taxi is much more convenient. One can also use the railway line which doesn't reach the main attractions, but you can rent a bike or scooter to roam around. Landscape with vineyard in Chianti. The medieval walled city is famous for its striking towers and notable art. The area is not big and thus it is perfect for a day trip. There are a lot of places that will pique your interest. The rural setting and the enchanting medieval streetscapes are some of the things that have held the history of the area intact. While in San Gimignano every summer day-tripper wants to get to the top of Torre Grossa, the tallest among the towers of San Gimignano. The view from here is breathtaking and you can see the untouched landscape of the area bathed in the sun. 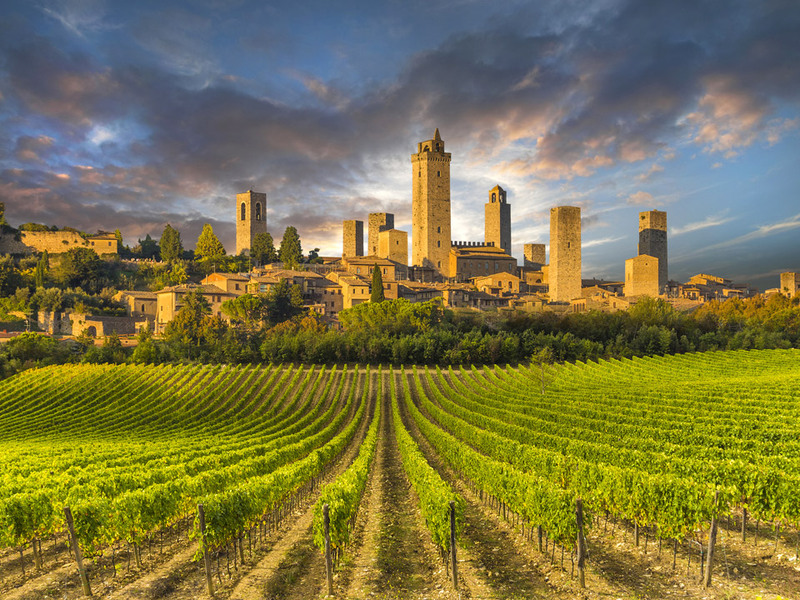 The area is also known for its white wine, and even though Chianti may be the more famous cousin you will soon appreciate the citrus flavors of the Vernaccia di San Gimignano. For a little taste of the area there is Gelateria di Piazza which serves delicious meals, something that will be affirmed by the line you find at the door. Once you get to San Gimignano you can walk around the place or use a bike to move faster either way the distances are short. You also have a good choice of San Gimignano hotels to choose from. View of vineyard in San Gimignano. Located in the south of the Uccellina mountain range the fishing village of Talamone is a charming little place to visit. It is distinguished by the old fortress of the Aldobrandeschi family. 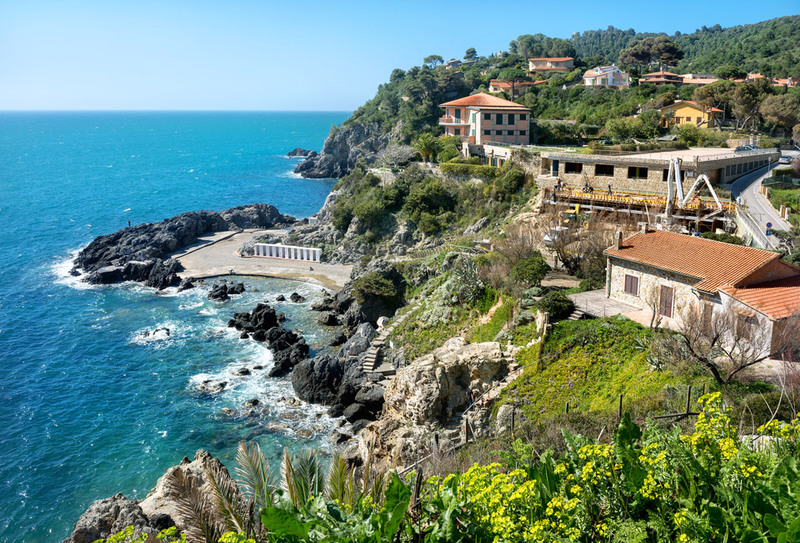 Over the years the little gem of the Tuscany area has become a famous seaside destination. The beaches are covered in white sand and the deep blue waters complete the scenery perfectly. Travelers can enjoy water sports like kite-surfing, sailing or windsurfing on a beautiful sunny day. The Museum of the Lagoon is also a good place to visit which tells you more about the lagoon of Orbetelo where there is a unique ecosystem in which fresh and marine water fish cohabit. Talamone cuisine like the rest of Maremma is inspired by the environment and uses local products. There is wine tasting for the visitor who wants to have a taste of Talamone's wines. You will also find reasonable accommodation at hotels in Talamone. The area is unique because there is great variety in the scenery. Lying between the provinces of Grosseto and Livorno, the region has great historical value with roman and Etruscan remains to see. The 160 km shoreline is a stretch of beautiful water featuring beaches that continue to win the Blue Flag award each year. The area has remained untouched by urbanization and the great number of tourists staying true to its roots. Maremma is not the most famous in Italy when it comes to cuisine, but the food is good as well. One of the distinct dishes is the acquacotta soup, which is served with unsalted bread. Once you get to the area by bus or train it will be much easier to have a private car to drive around, but you will not need it much because all the fun is in the water. If you want to take a refreshing bath, then you can check out Saturnia, a beautiful little town in Maremma famous for its thermal baths. You can check out the different Maremma hotels here. Maremma foggy morning, farmland and green fields. It is the second city of Tuscany after Florence, but the beauty and splendor of the renaissance art and palazzi rivals that of Florence. In the central piazza the Piazza del Campo the famous Palio horse race makes for an adrenaline pumping spectacle that is one to remember. Also, while in Siena, one can't miss a visit to the Duomo, the imposing cathedral filled with art and built in Romanesque style. 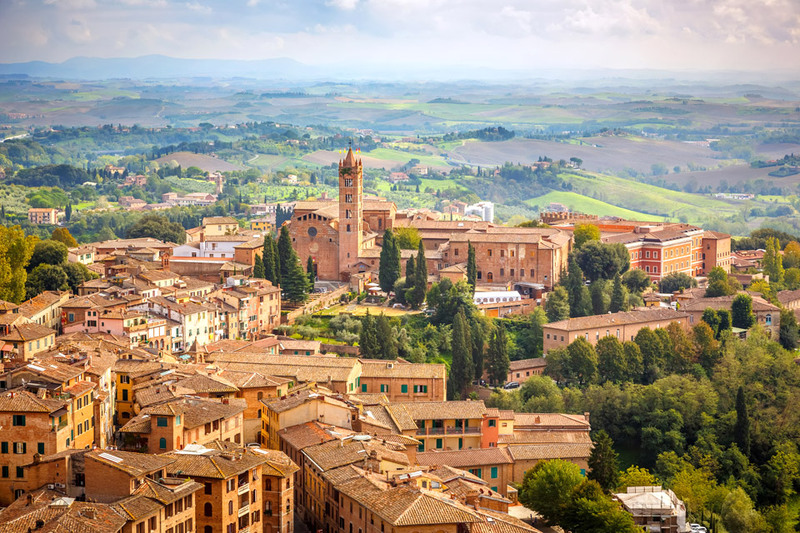 After enjoying all the art, you can get a panoramic view of Siena from Il Facciatone. During the night, a walk through the beautiful city is a great way to end a day of exploration. As for the cuisine, there are restaurants in Sienna that serve Tuscan cuisine at its finest. You can also find a fairly priced Siena hotel room. If you're visiting Tuscany there are a lot of interesting tours worth checking out as well. See the very best of Tuscany on a full-day trip from Rome! 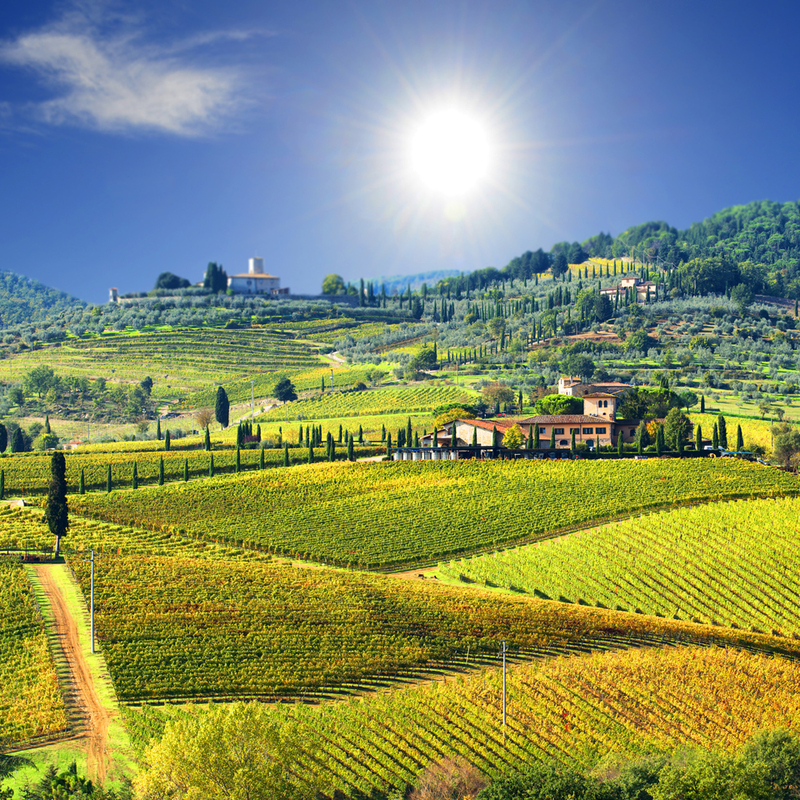 Enjoy an half day small group tour to discover the beauty of the Tuscan wine country. A view of the Chianti hills and its medieval villages such as Monteriggioni, Certaldo and San Gimignano. Aerial view of the city of Siena. 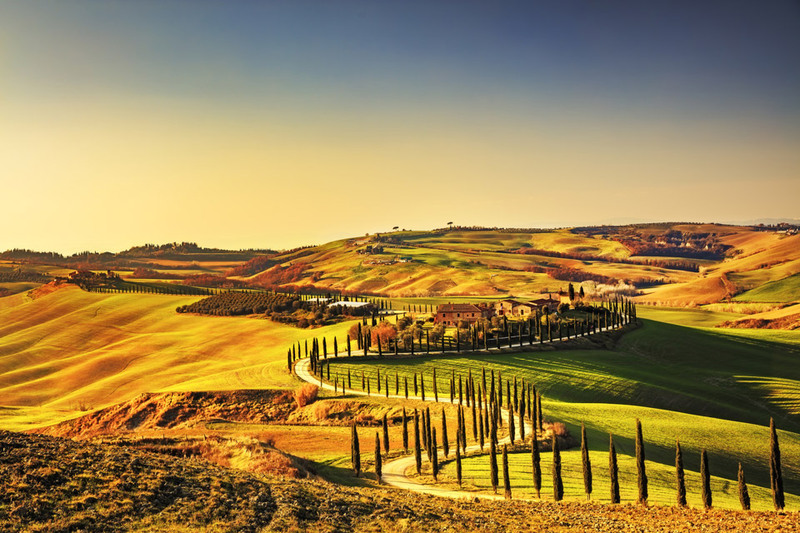 Known for its magnificent landscape of rolling grass the area encapsulates the brilliance of the outdoors in Tuscany. The Ascino, a basilica in Senesi is filled with renaissance art done by Sodoma and Signorelli back in the medieval heyday of the region. The Abbey of Monte Oliveto Maggiore is also another attraction that is a must see if you are in Crete Senesi. On your lunch break you can try Cinta Senese ham, a specialty of the area that is served with a glass of the finest Brunelli wine also from these lands. To explore the area well it is best to use private means from Siena to Crete Senesi so that you can enjoy the tour fully. You will also have no problem finding a hotel in Crete Senesi. A farm in the countryside Crete Senesi. It is the metropolitan city that is the capital of the Tuscany region. It grew in medieval Europe due to its status as a center for trade and finance which made it one of the richest cities in the time. It is considered the birthplace of the renaissance and has a lot of art from that time to show for it. Visitors will be overwhelmed by the amazing palaces, museums and churches. The most popular sites in Florence include; the baptistery, the cathedral, the Academia, the Bargello, Ponte Vecchio and the Ufizzi. If you are out looking for Michelagelo's genius artwork then you will find plenty of it in the library of San Lorenzo. A tour of Florence is not a one-day thing. You will need at least three days to take in all the beautiful places there are to visit. Moving around on foot once you get to your destination is the best way to see the city. Food and wine are at their best here and there is a combination of many Italian cultures in the cuisine, just enter a nice place and surprise yourself. The hotels in Florence cater for all types, from the budget aware to the big spender. Ponte Vecchio bridge over the Arno river in Florence. The island is the largest in the Tuscan Archipelago and ranks as the third largest island in Italy. 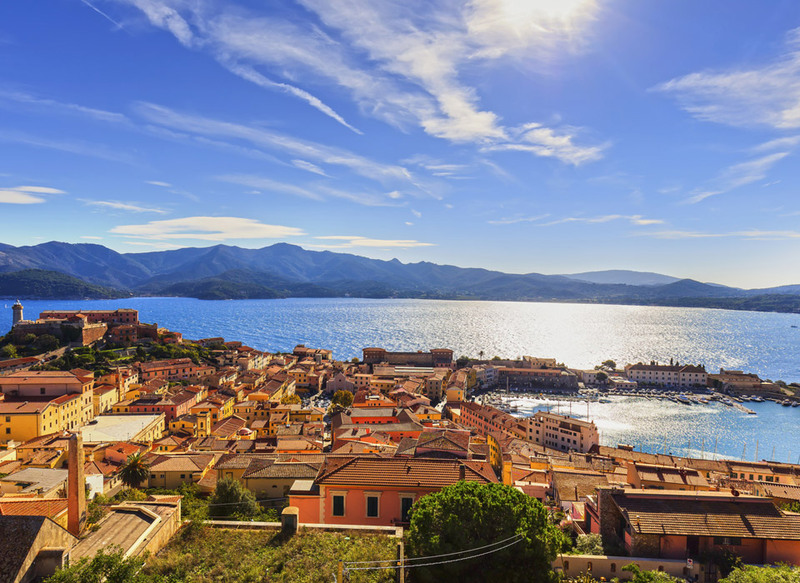 There are multiple ways to get to the island of Elba it all lies in your budget or preferences. The most common and also the sensible way to get there is through a ferry from Piombino. From roman ruins to clear waters and sandy beaches this little paradise is the ultimate destination for holiday makers. In the month of August the island has a tourist explosion as most Italians go on vacation during this month therefore, you may want to avoid it at such times. The island is famous for harboring Napoleon, the French Emperor when he was exiled in 1814. The archaeological treasures found there will also enlighten you on its history even before the famous French Emperor came. Snorkeling and diving are some of the activities you can enjoy on the island. You can also get easy access to an Elba Island hotel room. Elba island, lighthouse and fort. 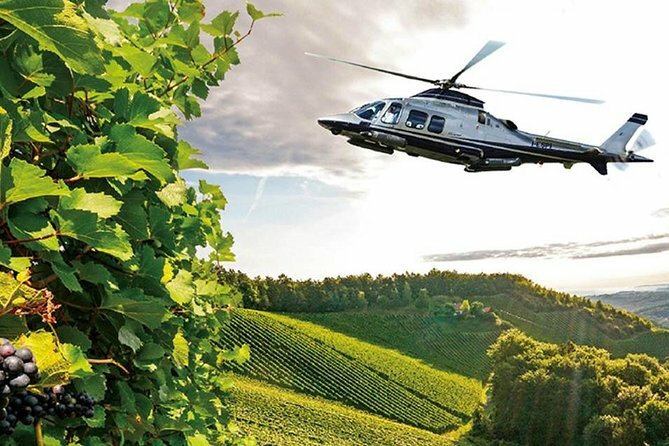 It is a must-stop for the typical itinerary to explore the Tuscany region. While a day trip might be enjoyable, taking a few days to see the area is better and your can make it you base for exploring the northern and central parts of Tuscany. It is easy to get to, coming from Siena or Pisa which makes it ideal for visitors using public transportation. The remains of the roman amphitheater and the San Martino cathedral are among the sites that you can fit in a one-day tour if there is not time to stick around. The culinary experience is also a part of the visit that you will enjoy, the authentic pasta of the area, tortelli lucchese is arguably the best in Tuscany. 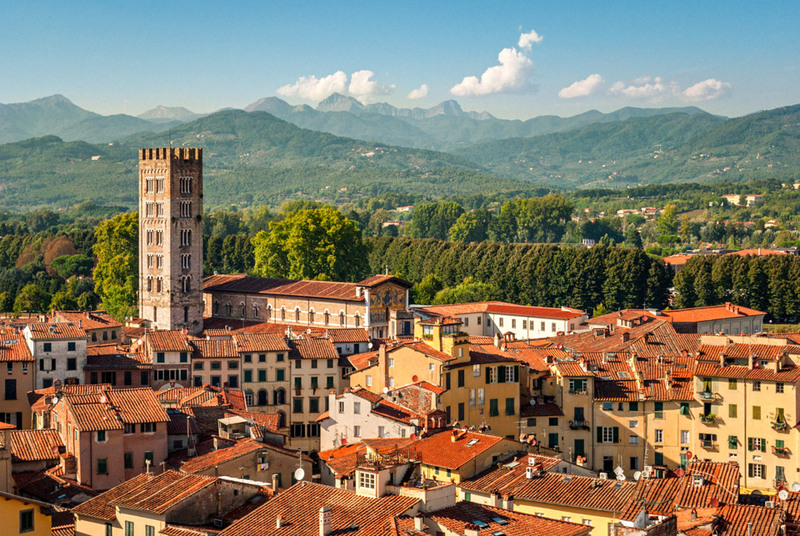 If you decide to stay and enjoy the area you can book a hotel room in Lucca without much of a fuss. Panorama of Lucca showing the Cathedral. 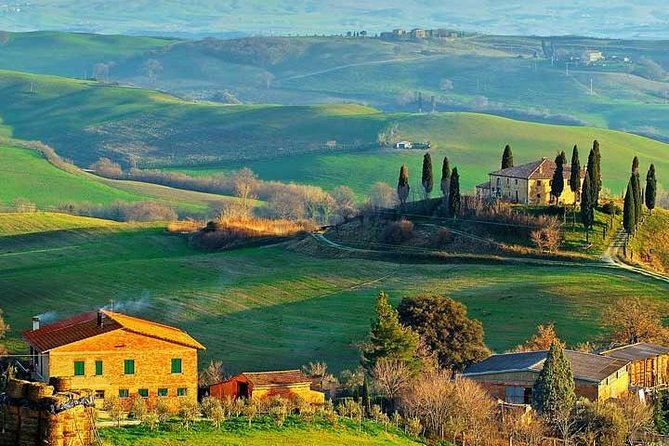 Val d'Orcia is a charming place with a landscape that is very distinctive. Sunny rolling hills, medieval castles, hilltop towns that stay hidden in silent tranquility, vineyards that stretch for miles, delightful farmhouses, and golden wheat fields are some of the elements that make up this fascinating landscape. The Orcia river which the valley is named after runs across the landscape and waters the whole valley. The region lies in the provinces of Siena and Grosseto. The fortress Abbadia S. Salvatore together with its Benedictine abbey, Radicofani that stands on the hilltop with a castle tower offers a breathtaking view of the valley. After all the exhaustion touring around, you can unwind in one of the thermal baths in Bagni di San Fillipo or Bagno Vignoni. The region is also rich in quality products like the Pecorino cheese of Pieza made with sheep's milk. 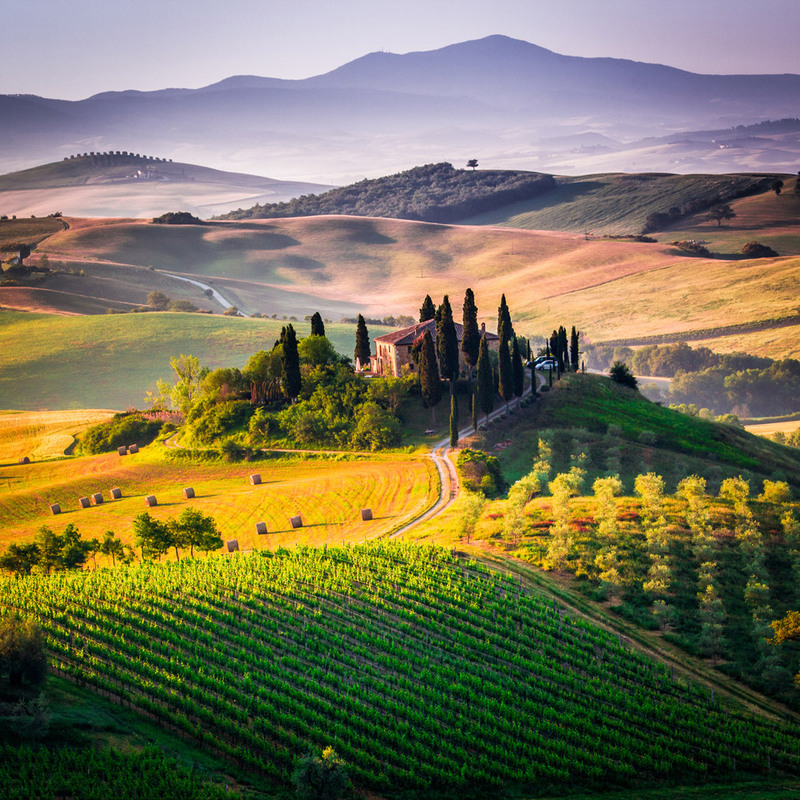 It is also the home of some of the most authentic Italian wines such as; the Nobile Montepulciano, the Brunello di Montalcino, the Orcia Vinsanto and the Rosso Orcia. The food is also amazing. If you pop into one of the little restaurants with outdoor sitting you ought to try some crostini with truffles or fried cheese served with bacon to get a little taste of the Italian cuisine served there. Getting around the area is quite easy as you can rent a cab or use the bus line which connects the whole region. There is the option of taking a train ride which will also get you wherever you want even though you will need another form of transportation to move around. You also have a lot of good option when choosing a hotel in Val D'orcia. Have you ever visited Tuscany? Let us know what you thought about the region.